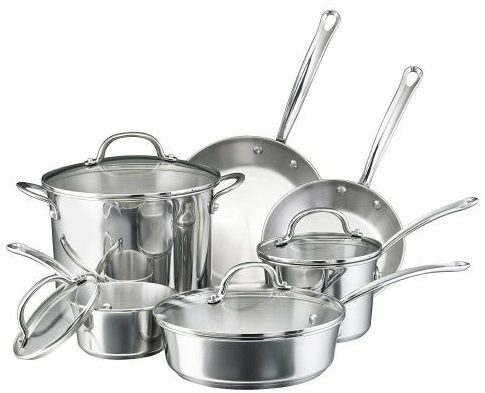 Top 10 Best Stainless Steel Cookware Sets in 2019 - A Must Have! Preparing a simple meal or experimenting with a new recipe needs an unfailing pot and pan. 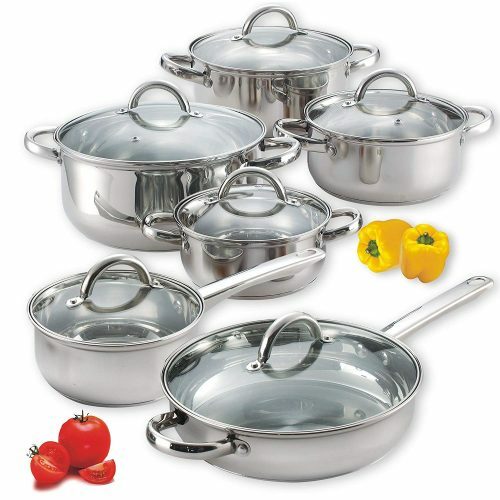 You need one of the best stainless steel cookware sets on the list here. The kitchenware offers you a top-of-the-line cooking experience. With the polished appearance, the set looks great standing in the kitchen and offers an extended lasting use for many years. You can use the pot and pan sets to prepare any meal from grilling to a healthier version. To make your selection easier check out the assortment we have picked to make your search easier. Add some style to your kitchen we promise each set will fit in with your kitchen décor. For the best budget stainless steel cookware set, no one makes a more affordable buy than Cook ‘n Home does. 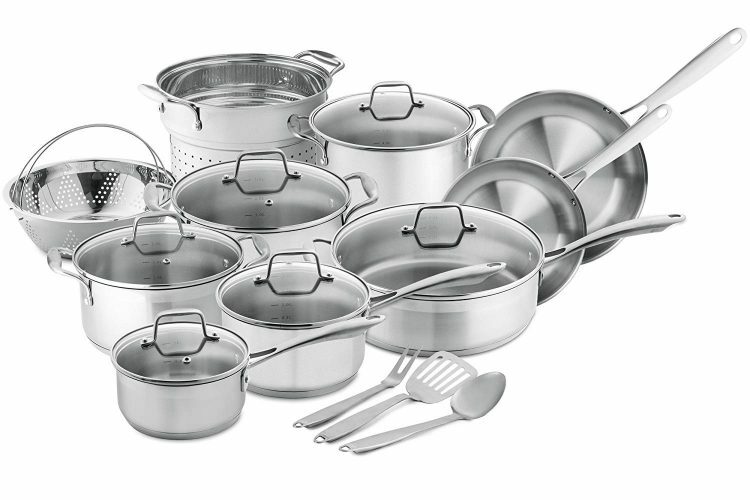 The 12-piece set comprises of 18/10 stainless steel with glass lids and oven safe. The polished mirror exterior looks excellent standing in the kitchen. The rivets on the handle are durable and sit comfortably in hand. With the glass lids, you can keep an eye on your food. The bottom of the cookware sets made with encapsulated aluminum. An added benefit is you can use the pots and pans for induction cooking as well. 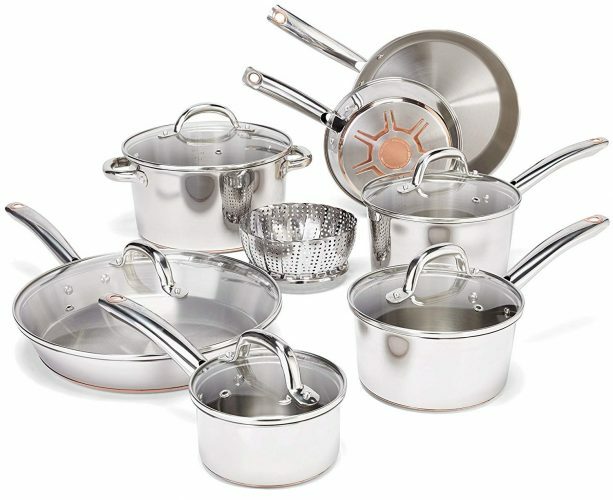 For the best long-lasting stainless steel cookware set, pick the Farberware Millennium selection. The pots and pans have an elegant tulip shape with durable construction and glass lids. The included pot is on the small side, and you get a large stockpot. The handles are riveted on the pots, pans, and cover for a comfortable hold without burning your hands. For easy cleanup, you need the Circulon Genesis stainless steel cookware set with nonstick design. With the DuPont, autograph nonstick coating food slides out of the kitchenware with ease. The product is utensil safe and looks elegant in the kitchen. The arrangement is impact-bonded with aluminum at the base for even heating and works on all stovetops. Do you need a good starter set for your small kitchen? 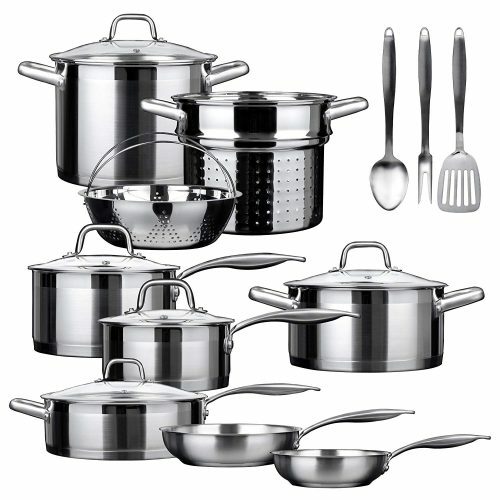 Look at the Cooks Standard stainless steel cookware set. The pots and pans nest in each other to save space when stored. The v-shaped handle design keeps it cool in hand, and you can place it in the oven. Compared to the other collections on the list the cookware set comes with metal and not glass lids. 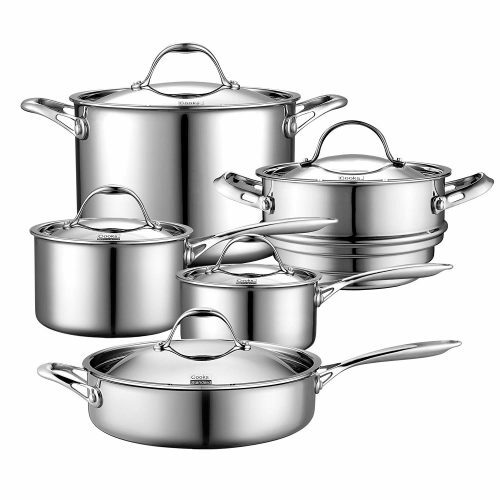 For the best overall stainless steel cookware set, nothing comes close to the Cuisinart Chef’s Classic series. For a new homeowner in need of a reliable arrangement of pots and pans, the matching collection comes out tops. You can use it on any stovetop and place it in the oven, dishwasher, and freezer. The handles have a patented cool grip texture to prevent your hands from burning as well. 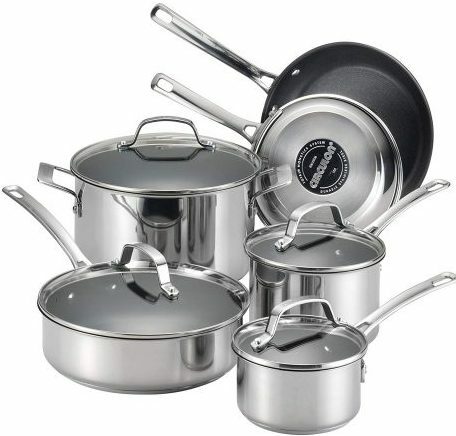 The T-fal suite of pots and pans is one of the best heavy bottom and multi-layered cookware sets you can buy. You can cook an elaborate meal with the 13-piece collection. The brushed stainless steel exterior looks fabulous and has a faint copper coloring. The handles are sturdy and comfortable in hand. With the glass lids, you can see your food cooking without lifting it keeping all the moisture in. Whether you are an amateur or professional chef, you will benefit from using the Chef’s Star stainless steel cookware set. The 17-piece comprises of everything you need to cook up a storm. The arrangements made with 18/8-grade stainless steel and durable to last a lifetime. The bottom of the pots and pans encapsulated with aluminum to speed up the cooking process. For the best middle range stainless steel cookware set, you need the Calphalon Classic. The arrangement offers you practical use with a mid-range price. The brushed exterior looks great in the kitchen with the tempered glass lids. The cover has a stainless steel rim with built-in straining holes. Furthermore, the cookware set has etched measuring marks. The Duxtop is one of the best induction-friendly cookware sets you can buy. The flat-bottomed cookware works well on any stovetop and heats up quickly. The 18/10-grade stainless steel has a hefty weight and durable to last a lifetime. The bottom of the cookware’s impact-bonded with aluminum for consistent heating. You can use the collection on ceramic and most other stovetops. 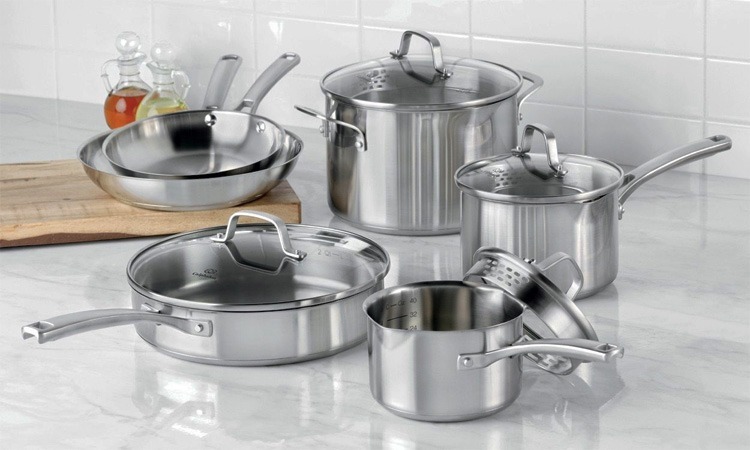 For the best high-end pots and pans, you will love the All-Clad collection. Whether you are an amateur or professional this collection has everything, you need to prepare a delicious meal. You can make quality cuisine food, and it looks fantastic in the kitchen with the starburst finish & polished look. The pouring rims flared into the sides and non-stick. Buying one of the best stainless steel cookware sets on the list offers you a perfect appearance fitting in with any kitchen décor. Furthermore, the collections durable to last a lifetime and sold at affordable prices. 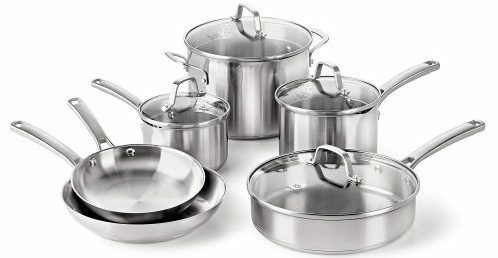 The pots and pans guaranteed to last and available in different sizes and sets.